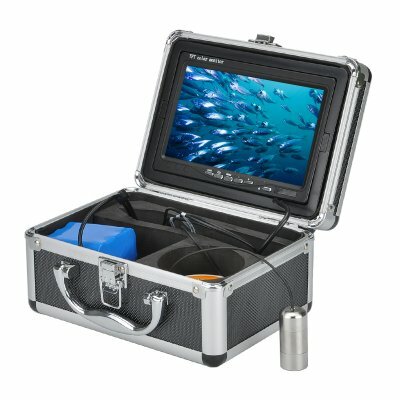 Successfully Added Underwater Fishing Camera - 1/3 Inch Sony CMOS, 12LEDs, 7 Inch Monitor, 92 Degree Viewing Angle to your Shopping Cart. Coming with compact carry case makes it easy to take with you on every trip. The perfect way to locate fish this fishing camera will maximize your ability to find fish, track their movements and enjoy more catches. With a 1/3 Inch color SONY CCD lens this under water fishing camera brings grabs high resolution images of all the underwater action letting you view the fish and find the perfect spot to cast your line. This digital fishing aid will transform your fishing and bring you an incredible array of information to help land the big ones. Seeing exactly where the fish are located, what they are eating and how they are reacting to your lure will let you tailor your line, hooks and bait to ensure the fish will be biting. With its portable carry case its quick and easy to set up and the wide operational temperature range lets you use if in all sorts of conditions, so whether your ice fishing or cruising in the Bahamas this underwater fishing camera will be of great use. A 15 meter cable brings you a good operational depth and with 12 white LEDs brining plenty of illumination you can use it day or night . A large 4500mAh battery keeps it powered for long periods so its always ready to guide you to the next fishing spot.